After PhonePe App Recharge, Bill Payment & Sending Money 50% Cashback [1st UP.. there is one more offer running for all users. 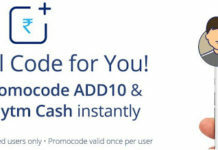 Get Recharge & Bill Payment 50% Cashback up to Rs. 75. Maximum cashback is fixed at ₹75. In a case of dispute, PhonePe reserves the right to the final decision on the interpretation of these Terms & Conditions.